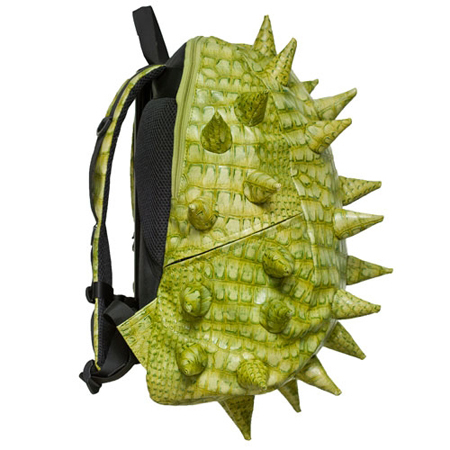 Spiked Bowser Shell Backpacks Available From MadPax | OhGizmo! According to MadPax’s website, these backpacks were designed with an aim for the punk aesthetic, but I know a koopa shell when I see one. The backpacks will certainly stand out in a crowd, if not by the neon bright colors, than the sheer awesomeness of spikes coming out of what is essentially a giant turtle shell. The Spiketus Rex (latin for “King of Spiketus”) line of backpacks feature two side pockets, One giant zip opening to the interior and a smaller pocket inside for keys or money. MadPax offers the leather backpack in 4 sizes and a dozen or so colors ranging from “Got your Black” black to “My Spicy Mustard” yellow. The big 17”x12”x9” Full packs run at $60, but you can get the lunchbox sized “Nibbler” for $28, or the even smaller “Mighty Bite” for $15. I always wanted a king koopa backpack! Too old for it now but my daughter would love it!